Make a plan before you start soldering anything. You can also test connections with jumper wires. Don't use old or crappy looking wires. They can be broken inside. 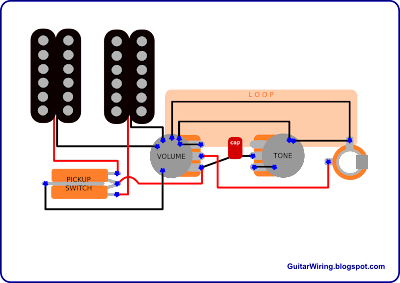 The loop of ground wires is a popular cause of unwanted noise or interference in the guitar signal. This is the similar wiring, but there's the loop of ground wires (black). The star shape/system means, that you need to have some centre point, where many ground wires will be connected together - like star rays. It's usually impossible to have the whole guitar wiring in this configuration. You should just try to keep the circuit in this way. Why? It makes the order, and will help you to avoid loops. To keep your wiring close to the star shape, you can use potentiometer metal cases, or jack socket pins. Volume pot case is a common place for the center point. This wiring can be a good example of a good „star shape”. This wiring is not so close to the star shape, like the one above, but it's also good. It's got order with no loops. This wiring diagram shows, that the star shape can be sometimes impossible to make. It's not a bad wiring. The star shape is only a pattern, to help you to make a good order of wires, and to avoid loops. A lot of long wires, means a lot of places, where your wiring can „catch” the hum. In the most of popular guitar wirings it's not a problem. They are quite small and uncomplicated. If you are making some more expanded circuit, you should keep this rule in your mind. Try to make your „maze” quick to pass. What to do with long wires? You can twist together hot and ground wires - plus and minus. It's a good anti-hum thing. You can use some thin coaxial cables, so you will get the ground and the hot wire in the one, good quality path. It's also a good hum prevention. It works just like a common guitar cable. 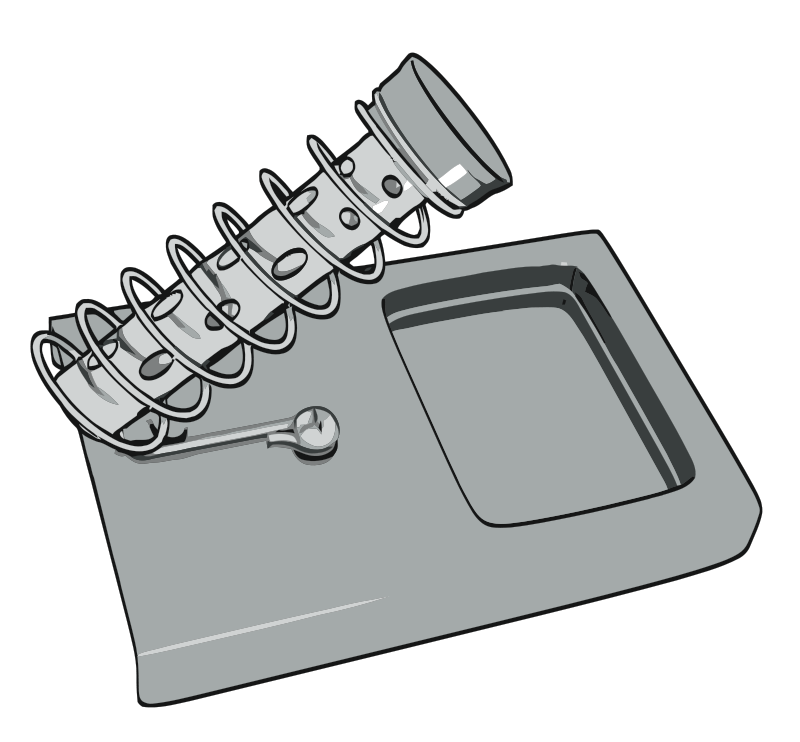 Another place, which can „catch” the hum, are metal parts placed close to pickups. Strings together with the bridge are those parts. The most common method to avoid the hum caused by these things, is connecting the bridge to the guitar ground circuit. If you open the potentiometers cavity, you will see, that there is a wire, coming from the hole in the wood, from the bridge side. This is the bridge ground wire. Most of wiring diagrams (also mine), don't showing this wire. It's basically not a part of the signal control, and it's always the same. However, you should remember that your guitar bridge need to be connected to the ground. Make a shield – if your guitar don't have it. You can use some thin copper tape, or graphite spray. Use it only in places where it's necessary. The best place to make a shield is the cavity, where potentiometers and switches are mounted. Pickup cavities also can be good for it, but if you will make the shield too close to the pickups, it will affect their magnetic field. It can change the tone. 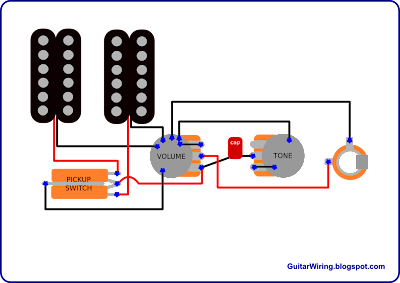 To make a guitar wiring ground properly, you just need to stick to a few simple rules. It's not difficult. The most of mistakes are made because of not respecting these few simple things, described above, in first parts of this article.